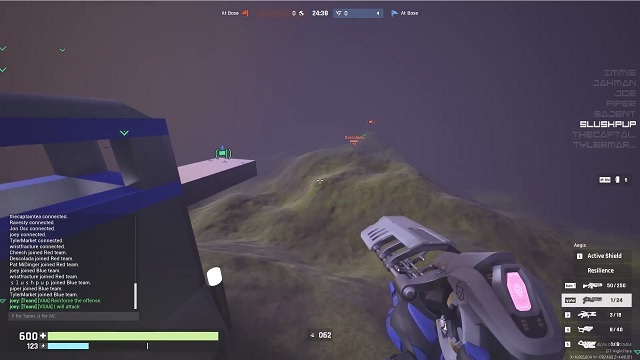 Midair, the upcoming Tribes-like FPS from Archetype Studios, will go into closed beta by the end of the month. In order to gain access, you’ll need to purchase the early access version on Steam, or get the closed beta pack from the official site. In slightly worse news, the game’s release date has been pushed back to early 2018. Midair is aiming to fill the Tribes-shaped hole in our hearts. It’s a fast paced FPS with jetpacks and skiing, flexible classes and a bunch of items to customize your loadout with. It’s going to be free to play, and is supposed to launch with three game modes. One of those is Rabbit. Rabbit! It’s the most underappreciated game mode in the history of game modes. The game was successfully Kickstarted last year, and was supposed to come out in November this year. As they explain in the latest blog post, the devs decided to push it back to December because it was a more realistic goal. However, December is crazy time in videogameland, so they’ve bumped it again, to avoid all the AAA games and their nasty, greasy marketing budgets. Smart move, that there. It’s now planned for an early 2018 release. The closed beta is going to start on August 25th. That’s soon! Beta access packs are being sold on the devs website for $35 – we presume it’s going to cost as much on Steam. Tribes games keep failing, but the romantic in me wants to believe it’s all thanks to being grossly mismanaged. It’s a wonderful concept, after all. While most FPS games try to ration your jetpack time (if they even allow it), Tribes always encouraged you to act like you’re the heir of a jetpack fuel empire. Midair seems to be pretty Tribes-y at heart, so I’m hoping for the best.